Whether planning an entire Alaska vacation or seeking the perfect day trip from Anchorage, these one-day itineraries pack in a lot of Alaska adventure and take full advantage of summer's extended daylight hours. On the drive into historic Talkeetna, follow signs to the Talkeetna Alaskan Lodge to get the best views of Mount McKinley on a cloudless day. Dine and shop for Alaska art in Talkeetna. Circle Mount McKinley's summit on a scenic flightseeing tour; Opt for the glacier landing at Denali base camp. Take a scenic jetboat ride or gentle raft float to watch for and photograph wildlife. Spend the night at Alaska cabin, lodge, bed and breakfast, tent or RV campground. Summer reservations recommended. 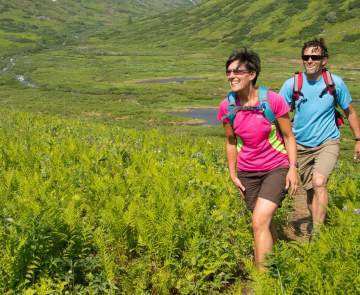 Anchorage day trips that allow one to spend a day exploring Alaska hiking trails, gold mines and Alaska's largest roadside glacier. Lodging is available at several points near Matanuska Glacier and towns throughout the Mat-Su Valley. First stop, Hatcher Pass and Independence Mine State Historical Park. A self-guided tour provides the tale of bygone Alaska gold rush days. Young and old are fascinated by the abandoned mine buildings and awed by surrounding mountain majesty. Hike through treeless tundra and discover Summit Lake. Identify wild flowers or pick ripe berries in late summer. Enjoy a snack, meal or piece of pie at the lodge before driving towards Palmer to pick up the Glenn Highway, which leads to Matanuska Glacier (mile 102). Park and walk a short, easy distance to touch the glacier ice. 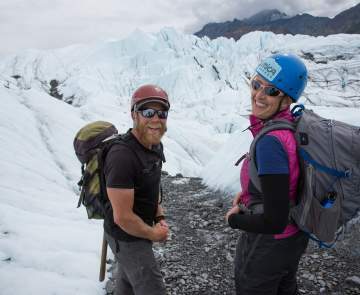 Guided glacier treks available. Enjoy an evening raft trip on the mighty glacial fed Matanuska River. In these day trip ideas, explore Wasilla and Palmer for an Alaska dog sledding experience and discover Alaska's unique agricultural history. Visit Iditarod Sled Dog Race Headquarters. Learn about the world-famous 1,100-mile sled dog race to Nome. View race memorabilia, photos and footage, pick up souvenirs and take a thrilling summer dog sled ride. Visit an Iditarod musher's kennel for the ultimate learning experience and a chance to meet future champion pups. Feast your eyes on fresh produce sold weekly on Wednesdays at the Dorothy Page Museum and Historic Town Site. Ten miles from Wasilla is the city of Palmer, which is rich in agricultural history. Learn about the colonists who came to the area at the Palmer Museum of History and Art and Colony House Museum. Admire flowers and vegetables at the Palmer Visitor Center's Showcase Garden. Tour a restored Colony home (circa 1935). Purchase Alaska grown produce and quality Alaska made gift items at Friday Flings open air market, downtown Palmer. Marvel at giant vegetables and cabbages displayed at the Alaska State Fair, late August.